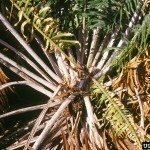 I trimmed cold burned fronds off of 7 sago palms. The deed is done. I have done my own before and had beautiful results. These 7 are at a commercial location on the beach in SE North Carolina. Complaint is they look like pineapples. Can I feed them anything? I felt warmer sunny days would bring them out again. They can regrow their leaves, but it may take quite some time. Losing their fronds is quite stressful for them. Use a balanced fertilizer for these plants.